Top: Hamanaka Katsuo at the entrance to a hole where he grows udo. In Japan, there's a plant grown underground called nanpaku-udoit's a soft white vegetable used in haute cuisine. The udo is a perennial of the Araliaceae family. It is favored for its crunchy texture, and is used in tempura, soups and vinegared miso dressings. Growing it away from sunlight makes the plant soft and gives it a pure white color. Nanpaku-udo is also called Tokyo-udo because it is cultivated mainly in western Tokyo. Around 1927, some farmers realized that udo could be successfully grown in holes used to store sweet potatoes, and soon more and more people were digging holes for udo cultivation. One udo farmer, Hamanaka Katsuo, grows them in the city of Kokubunji in western Tokyo. He said, "In the old days, farmers didn't have greenhouses, but they found that the winter months, when other crops would not grow, were ideal for cultivating udo in naturally warm holes in the ground." 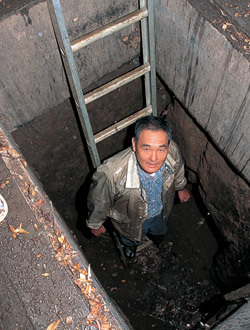 Hamanaka has seven udo holes in his field, five of which he dug with his father, Teiichi. Each hole is 3.5 m deep, and has lateral cavities about 1 m high carved out at 90 degrees to one another. 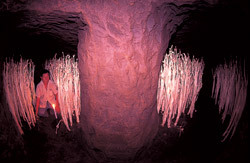 The lateral cavities have become a subterranean udo plantation. Western Tokyo is built on a thick layer of volcanic ash that has weathered to make a red soil called Kanto loam. Strong enough to not cave in when dug out, the loam makes it possible to grow udo in this way. Above:Ogasawara Jun-ichi shows people around this undersea station. There is a shaft from the station to the surface for emergency use. 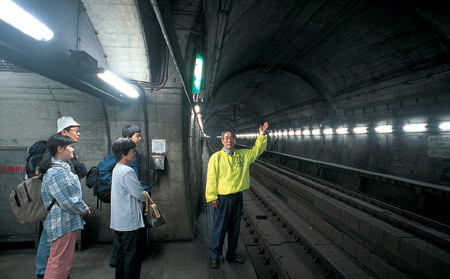 The Seikan Tunnel runs under the Tsugaru Strait, linking the islands of Hokkaido and Honshu. The tunnel is 53.85 km long, making it the longest in the world. The portion under the strait, 23.3 km in length, has two stations: Yoshioka Kaitei on the Hokkaido side, and Tappi Kaitei on the Honshu side. Ogasawara Jun-ichi retired from a railway company called JR Hokkaido, and now goes every morning to work as a tour guide at Yoshioka Kaitei Station. He and the other guides stay there until the evening, working 147 m under the sea. He shows visitors around the station and gives information on the tunnel structure and digging techniques. "For example, I'll explain that at this depth, the earth exerts a pressure of 100 kg on an area the size of a 10-yen coin, about 4 cm2. 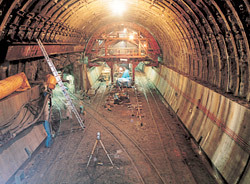 Another piece of trivia: when the tunnel was dug from both ends, the engineers were off by a vertical distance of only 19 cm when the two shafts met under the sea. The best part of this job is seeing how surprised people are when they hear facts like these." Ogasawara says his job as an undersea guide often reminds him of the hurdles the tunnel builders faced. Special Feature* Cover Interview What Is This? Trends Today Living In Japan Has the Japanese Crested Ibis Been Saved from Extinction?